- IC ZP 103B : a cover illustration for "The Vigilante of Pizen Bluff", from 1998, by Marco Rota. William F. Cody, called Will or Willie by his family, was born on February 26, 1846, in a log cabin west of the Mississippi River in Scott County, Iowa Territory, son of Isaac Cody and Mary Ann Bonsell Laycock. By the time he was 15, William had been a bullwhacker, a mounted messenger, a trapper, a gold prospector and a Pony Express rider. He served 18 months in the Civil War as a scout for the 7th Kansas Cavalry. After the war, in 1967-1968, Cody briefly operated a hotel, drove a stage, and he gained his nickname for killing 4,280 buffalo in eight months to feed the Union Pacific Railroad workers. He became one of the most renowned prairie scouts and received the United States Medal of Honor in 1872 for gallantry as an army scout, but a congressional ruling in 1917, shortly after Cody's death, caused his medal to be revoked. Already heralded in dime novels by 1870, in 1872 Cody took to the stage portraying himself. On July 17, 1876, just three weeks after Custer and the 7th Cavalry met disaster at Little Big Horn, Buffalo Bill had his most famous encounter. Cody led a squad of soldiers and scouts in a reckless charge on a squad of Cheyennes. In the ensuing hand-to-hand fight with Cheyenne sub-chief Yellow Hand (actually, Yellow Hair), Cody killed the Indian leader and took "the first scalp for Custer." This event had an electric affect on the United States. Cody, the warrior, had validated Cody, the actor. The real drama on the plains brought realism to the melodrama on stage. Legend was now elevated to myth. In 1883, Cody created the Wild West show, a vehicle that propelled him to fortune and worldwide fame. 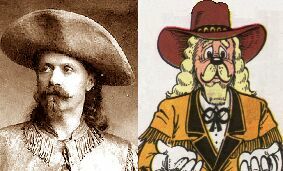 Buffalo Bill was also instrumental in settling the North Platte region of Nebraska and the Big Horn Basin of Wyoming. In later years Buffalo Bill’s Wild West would star the sharpshooter Annie Oakley, the first "King of the Cowboys," Buck Taylor, and for one season, "the slayer of General Custer," Chief Sitting Bull. Cody even added an international flavor by assembling a "Congress of Rough Riders of the World" that included cossacks, lancers and other Old World cavalrymen along with the vaqueros, cowboys and Indians of the American West. Cody died on January 10, 1917 in Denver, Colorado. In "The Vigilante of Pizen Bluff", which takes places 1890, Scrooge meets him along with his uncle Pothole McDuck, Annie Oakley, Geronimo and Phineas T. Barnum, who are working in the Wild West show. All together, they chase, fight and catch the Dalton brothers, who have just stolen Barnum's money. But in this same story, he tells Pothole that he already knew Scrooge, at North Platte, (he calls him Buck), and that it was him who gave him the idea of doing western shows. Then, Bill and Scrooge talk together about their past life since they have last seen eachother, and Bill tells him that he even went to Europe with this show, while Scrooge tells he had been a prospector in Montana, a Lion hunter in Africa, and a coconut trader in Pacific, so they must have met before 1884 (at this date, Scrooge became a copper prospector). Fortunately for Don Rosa, Bill could have very well been in Arizona in 1890, as he had just returned to America after a tour in Europe along with Annie. He then also appeared on a cover illustration for "The Vigilante of Pizen Bluff", by Marco Rota. He also appeared by name in Barks' "Turkey Trouble", "Riding the Pony Express", and "War Paint".